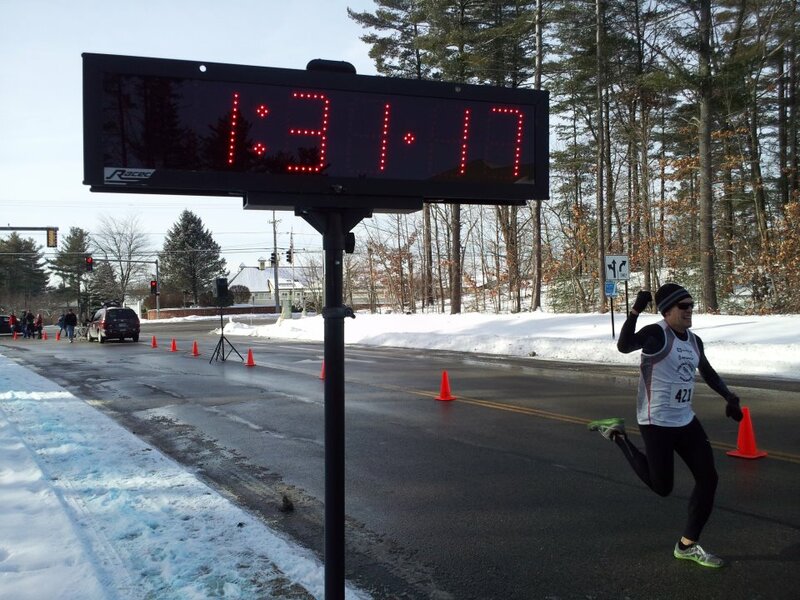 Tim VanOrden (Tivo) (above) doubles up this weekend (what else is new) with nice wins at the GSH Snowstorm 5k (hilly) and the modified Curly's Record Run course, where Tim holds 4 consecutive single-age course records, out in Pittsfield, MA. 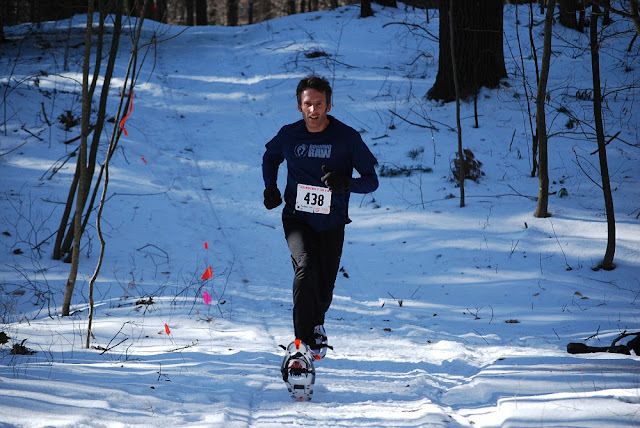 That is another race in the WMAC-Dion Snowshoe Series for 2012 (video below courtesy of Brad Herder, photo above courtesy of Berkshire Sports). Greg Hammett ran another solid winter track race down at the Terrier Classic at BU (Flotrack video below of Greg's come-from-behind near win). Dave Dunham ran to a solid second place finish in the 5000 Meters at the USATF East Region / NE Masters Indoor Championships in Providence RI. Updated (1/24) Scott McGrath is BOSS at the 17th Annual Boston Prep 16 Miler in Derry, NH on Sunday. Scott's first win of 2012 was a big one, besting 608 brave souls on the slippery roads of Derry, New Hampshire. He ran the 34th fastest time ever in the 17th years of the race, which usually attracts a very good field year in and year out. Scott's time was the 12th fastest CMS time and he's the 8th fastest CMS individual (Dave Dunham (2), Justin Fyffe, Byrne Decker (2), Greg Ward, Rod Viens (2), Dan Verrington (2), Andy McCarron). Scott is the 3rd different CMS runner to win the race. Dunham has two victories there (1997 and 1999), Byrne Decker (1996), and Andy McCarron (2009). This win comes as Scott is currently the poster boy for New England Runner, with a very nice shot of him sandbagging at the Cape Cod Marathon back in October. The top 100 times of all time for Derry Prep is here. On the snow, CMS runners fared quite well up in NH and out in Western Mass this weekend with multiple podium spots. Jim Johnson and Dave Dunham went 1,3 at Kevin Tilton's 2nd Annual Whitaker Woods Snowshoe race in Intervale, NH (part of the Granite State Snowshoe Series). Tim VanOrden and Dave Dunham went 1,2 out in Lanesborough, MA on Sunday at the Constitution Hill Snowshoe Race (part of the Dion/WMAC Snowshoe Series) with Tim Mahoney and Ross Krause finishing right behind in 3,4.